WICHITA, Kan. (NCBWA) – Forty-five players have been named to the midseason watch list for the eighth annual National Collegiate Baseball Writers Association Stopper of the Year Award, given to the top relief pitcher in NCAA Division I baseball, as announced by the association Thursday. San Diego's Michael Wagner headlines the nominees for the 2012 award. Wagner leads the nation with 18 saves in 22 appearances. He has pitched 35 innings with 31 strikeouts and is 1-1 with a 1.03 ERA. Among the other most notable nominees are 2011 Stopper of the Year Award winner Corey Knebel of Texas and preseason All-America selections Tony Bryant of Oregon State, Caleb Reed of Mississippi State, Austin Maddox of Florida and Nick Wittgren of Purdue. The SEC led the way with eight pitchers on the midseason watch list, while the ACC had five pitchers on the list. Eighteen conferences are represented on the list. R.J. Alvarez Florida Atlantic Jr.
Jake Barrett Arizona State Jr.
Robert Benincasa Florida State Jr.
Tony Bryant Oregon State Jr.
Tyler Burgess Missouri State Fr. Scott Coffman New Mexico State Sr.
Michael Dimock Wake Forest Sr.
Matt Duncan Morehead State Jr.
Cale Elam Wichita State So. Preston Hatcher Western Carolina Jr.
Brett Huber Ole Miss Jr.
Nathan Hyatt Appalachian State Sr.
Kenny Long Illinois State Sr.
Stefan Lopez Southeastern Louisiana Jr.
Michael Lorenzen Cal State Fullerton So. Tanner Merritt East Carolina So. Michael Morin North Carolina Jr.
Chris O'Grady George Mason Jr.
David Peterson College of Charleston Sr.
Caleb Reed Mississippi State Sr.
Chad Sobotka USC Upstate Fr. Michael Wagner San Diego So. 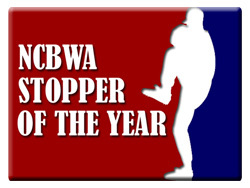 Nominations for the NCBWA Stopper of the Year Award were made by baseball sports information/media relation contacts and more than 90 nominations were received. At the conclusion of the regular season, the Division I national saves leader and four other relief pitching standouts will be selected as finalists and released Wednesday, June 6, prior to start of NCAA Super Regional tournament competition. The NCBWA's All-America Committee will select the winner, with this year's recipient to be announced during the 2012 College World Series. Texas hurler J. Brent Cox won the inaugural Stopper of the Year Award in 2005, with Don Czyz of Kansas claiming the honor in 2006, Luke Prihoda of Sam Houston State winning it in 2007, Georgia's Joshua Fields topping the field in 2008, San Diego State's Addison Reed grabbing the honor in 2009, Texas' Chance Ruffin earning the honor in 2010 and Texas freshman Corey Knebel winning it last season. For more information on the NCBWA Stopper of the Year, contact Tami Cutler at Wichita State at 316-978-5559 or Russ Anderson at Conference USA at 214-774-1300.